HI Lovelies! 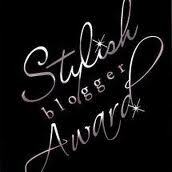 I have gotten a blogger award! I’m so happy! Thanks to TheMissTwist !! 1. Link back to the person who gave it to you. 3. Tag 7 people and let them know you done so! 3. I used to be the “ skinny one” among my friends.. but not anymore.. I’m a little sad about that..
4. I aways thought I would never be a gambler.. but I guess I am. but still a very conservative one! 5. I still wear some of the clothes I had since I was in elementary school. 7. I love makeup but apparently I love sleep even more... >_< ! Before I end this post, I just want to say that I did my Giveaway Video as promised over the weekend! But ... the lighting and everything really made me look different & not in a good way.. so I was not too happy about it and decided that I’m going to re-film it tonight.. haha =P i’m picky.. yeah.. But Don’t Worry, I will post the Giveaway Video ASAP. So stay tuned for that! Ahh! Thank you for the award gorgeous !! You're way way wayyyyy too kind :'D <3 ! hope you dont mind if i do so as well > <"
French fries with soy sauce, I must try this! Congrats on your award!! !You deserve it! Thanks for passing it to me, such a great honor! Thank you so muchhh!! wow you're the only person I know who ate french fries with soy sauce! !